You have invested a lot of time, energy and money in your home. You want that outside as inviting as the inside. But don’t let darkness cast a shadow on your home’s appeal. 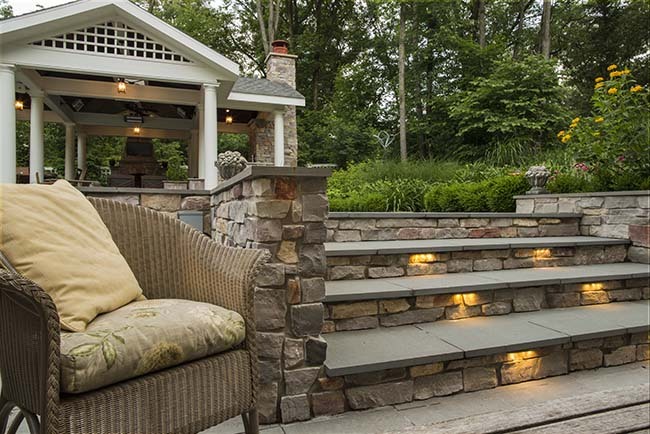 Outdoor lights can illuminate your outdoor living space at night and provide a level of ambiance. At the same time, it will add safety and security to a typically dark part of your home. And while installing a low voltage outdoor lighting system sounds easy, it is much more than pushing some lights into the ground. Designing and installing outdoor lighting requires forethought, quality materials, experience, and a solid plan to create a beautiful lighting system. Without proper expertise, there are many ways your outdoor lighting can fail. Let’s shed some light on why you want to hire a lighting professional instead of embarking on a potentially disastrous DIY project. There are also certain aspects of your fixture placement that must be taken into consideration before installing your fixtures. To ensure long-lasting enjoyment, fixtures need to be placed in such a way that they will not become needlessly damaged. Outdoor lighting is only as good as the electricity that powers it. Working with electricity is dangerous if you don’t know what you are doing. Plus, safely installing lighting may require proper licensing. An outdoor lighting professional will already have this and will know what building permits will need to be obtained before installing it. Another key component of a successful lighting system is how everything is tied together. If this isn’t done right, then everything will fall apart. This includes the kind of electrical wires you need and how deep it needs to be buried. Wire connections also need to be considered. They must be able to keep your wire well-insulated and protected from water. These are the kinds of considerations professionals will plan for, but a weekend DIY warrior may forget. Many people are quick to purchase landscape lighting fixtures from a local retail hardware store. The appeal is that these are inexpensive, and can be installed by the consumer. But unlike plastic or metal kit lighting, a professional grade system is comprised of architectural grade components engineered to be installed by an experienced professional. High-quality lighting effects can’t be performed with “kit” lighting. Big box stores’ lights have low output and are incapable of illuminating most landscape and architecture properly. In addition, they are only meant to last about 18 months, meaning you would need to replace these fixtures every couple of years at best. There is a larger variety of products available to lighting professionals that are not accessible to the general public in terms of specific high-grade fixtures, bulbs, and other products. Extend the enjoyment of your outdoor living space into the evening hours. Sprinkler Pro LLC can help by installing Kichler’s Design Pro LED lighting gives you three-color options while using less energy. Sprinkler Pro will work with you to design a lighting scheme which will enhance the beauty and functionality of your landscape. Plus, Kichler Lighting products come with a five-year warranty for LED components. For pricing estimates call Sprinkler Pro today at 330-995-0283.